By Dr. Carl F. Martin, Jr. 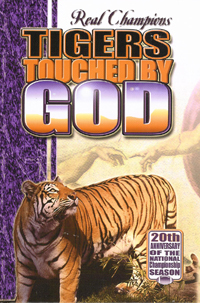 Celebrate the 25th anniversary of the National Championship Clemson Tiger Football team this year by ordering your copy of Tigers Touched By God. This book includes testimonies and a 'behind the scenes' look at the people responsible for Clemson's first football national championship ...intended to be an easy read designed to capture the hearts of the Tiger faithful. Tigers Touched By God presents the good news of Jesus Christ displayed in the lives of real people in a non-threatening and encouraging manner. This book features stories by Perry Tuttle, Jeff Davis, Mike Epply, Bob Pauling, Danny Ford, Bobby Robinson and many, many more. If you have any questions about ordering this book, please contact Lindsay Bickerstaff at 864.915.0447 or via email (click here). Group discounts are available.